After the ‘risky business’ with Ai Weiwei’s installation, I headed towards Alberni Street, walking up Bute (in Vancouver.) More art surprises awaited me. 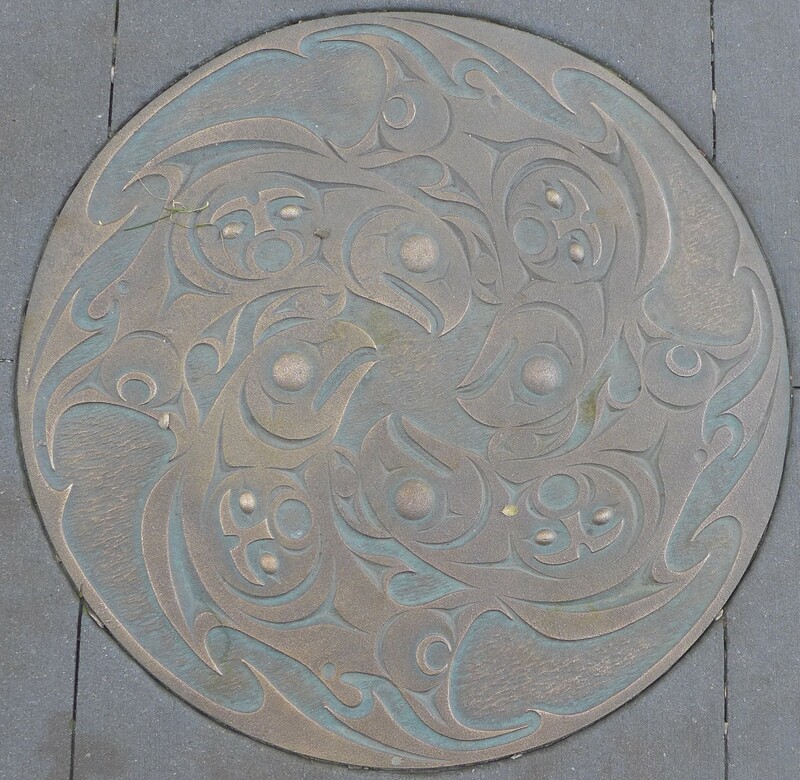 The medallions (not manhole covers, as I originally thought) are by Susan A. Point, a Coast Salish artist from British Columbia. Susan Point works in all media: from fine art prints to stained glass windows to House Posts and Welcome Figures….there are many images to enjoy on her website. This entry was posted in Susan A. Point, Vancouver and tagged Public Art, Susan A. Point, Vancouver on December 17, 2015 by terryvatrt. In my experience support for the arts and public art, means a heated discussion at the budget table. Library supports are up there too. Often a failure of imagination carries the day. Then these budgets are increased minimally, frozen or even decreased. It’s difficult to convince to people that literacy in the arts is correlated to good health, and that if the next $1M went to the arts and not healthcare, we would be the healthier for it. Thanks, Diane. What do you suggest as strategies for lobbying for high quality public art? That is such a complicated question. Will give it more thought and we can discuss the issue one of these days. Terry, It is such a complicated question. We will have to have a conversation one day. D.